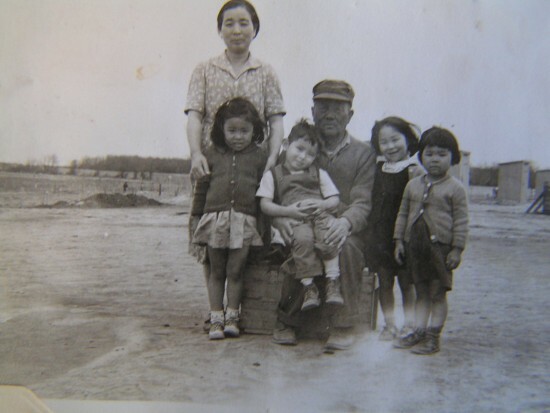 Yutaro Kawashiri with his family while in camp. Not too long ago, a homeowner discovered an empty suitcase tucked away in the attic of her new home. “Yutaro Kawashiri Family No. 39528” was written in red marker on one side of the suitcase. The age of the suitcase, the distinctive “Family No.” identification, and the Japanese surname could only mean the original owner of the suitcase had been in an internment camp during World War II. This discovery started the homeowner on a quest to find the owner or descendants of the suitcase that was more than 75 years old. With the help of a determined friend and the photographs, family histories and volunteers from the Palos Verdes Library District’s Local History Center, the suitcase was reunited with two of Yutaro Kawashiri’s granddaughters. Born in 1871, Kawashiri was one of the first Japanese vegetable farmers on the Peninsula. He and his family were interned at the Colorado River Relocation Center (Poston) in Arizona. After a few years working at the Seabrook Farms in New Jersey after the war, the family returned to the South Bay. Kawashiri died in 1950. While the reunion of a forgotten suitcase with family members isn’t a daily occurrence, stories such as this from the Local History Center illustrate the importance of documenting and preserving the unique history of the Palos Verdes community. 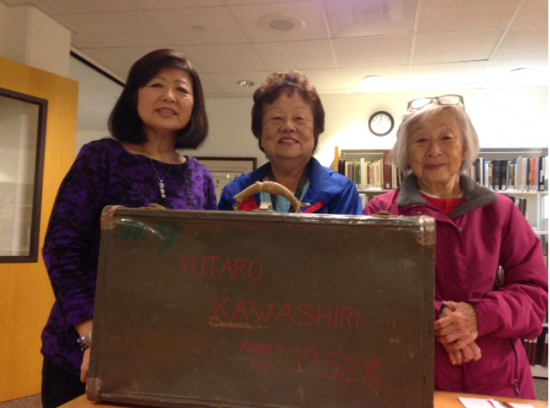 Pictured with Yutaro Kawashiri’s suitcase are his granddaughters Hideko Shono (right) and Kathy Kubota (center) with Pauline Hayashibara. The local history collection started at the Peninsula Center Library in 1969, just two years after the library was completed. The collection was housed at the Malaga Cove Library for many years, and in 2003, it was returned to the Peninsula Center and stored in a room with better climate control to help preserve the material. To this day, the collection continues to thrive and serves as one of the few resources documenting the Peninsula’s story. In 2015, the Local History Center interviewed and surveyed residents to learn how it could better meet the community’s needs. The center discovered a desire for photographs and records documenting post-World War II life on the Peninsula, as well as more materials reflecting the community’s diversity. Another key finding was the desire to have more materials online. With this in mind, the center applied for and received a grant from the Institute of Museum and Library Services for a project called Your Story Is the Peninsula’s Story (YSPS). Over the last six months, the center has been digitizing key materials and making them available online through its digital repository (www.palosverdeshistory.org). The Phillips Ranch Photo Collection and the first six years of The Palos Verdes Bulletin are now online. The center is currently preparing to add images from the Palos Verdes College Photo Collection. YSPS is also digitizing The Palos Verdes News between 1937 to 1967. As the longest-running newspaper documenting the Peninsula, this fully searchable database will provide access to a very important era in the Peninsula’s growth. A key component of YSPS is a series of public “scanning events” scheduled for spring 2016. The events encourage community members to bring photos and documents that capture their unique connection to the community to have them scanned and included in the digital repository. Community members — longtime residents and newcomers alike — create the Peninsula’s history. The Local History Center is holding an open house in the Peninsula Center Library Community Room, 701 Silver Spur Rd. in Rolling Hills Estates, on Saturday, Jan. 16, from 2 to 4 p.m. Don’t miss your chance to visit and learn about the center’s newest initiative and how you can play an important role in telling the story of the Palos Verdes Peninsula.